John, Jack, Jesse and Jim loved to play in the sandbox. They built castles and towers and mountains. Sometimes the four boys threw sand in each other's hair and eyes. John, the youngest, cried most of the time because his big brothers picked on him. Jack was rather clumsy. He slipped and slid and always had grass stains on his knees. Jesse, the quiet one, stayed out of trouble and didn't throw sand on anyone. Jim, the oldest, always got his brothers into trouble. One day Jim suggested they go down to the pond and catch frogs. Jesse didn't want to, but John and Jack talked him into it. Each boy took a jar to catch the frogs in, so they could bring them home and keep them. When they got to the pond, Jack slipped and fell into the water. All the frogs leaped away, except one, that landed on his head. Jesse started to cry. He didn't want Jack to drown. Jim jumped into the water to save his brother. A frog jumped on Jim's head too. Jesse tried to splash the frogs off his brother's heads, but they wouldn't go. John, wanting to show his big brothers that he was brave, jumped into the pond. Soon a frog jumped on his head too. 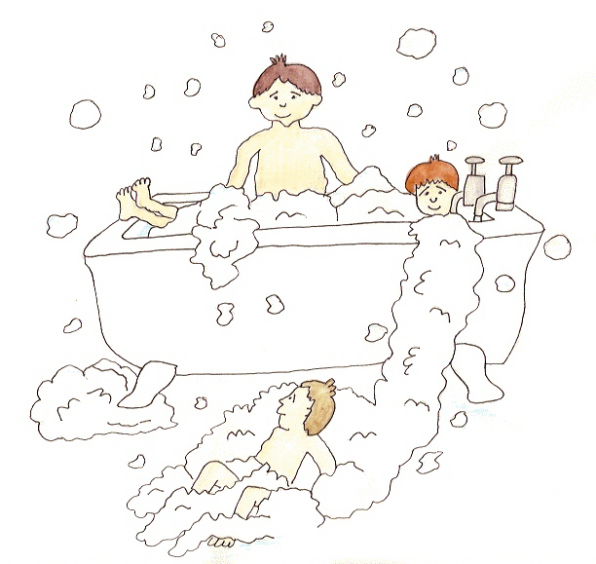 Jesse had no choice but to jump in the water with his three brothers. Their mama came to find them and saw all her boys in the pond with frogs on their heads. She grabbed their arms and pulled them out, one at a time. Without further delay she took them home and made them get in the bathtub to wash off all the frog footprints and pond water. Jesse slipped right out of the bathtub and landed on the floor.